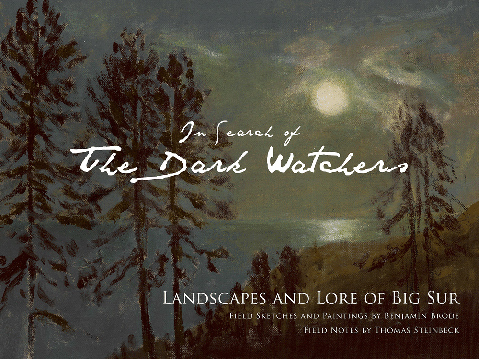 In Search of the Dark Watchers is the result of an artistic collaboration between author Thomas Steinbeck and artist Benjamin Brode. Noted novelist and storyteller, Steinbeck describes the inspiration for the book. On a gentle summer evening not long ago, Steinbeck told Brode about the legendary “watchers” who roam the wilds of Big Sur. Steinbeck recounts a narrative that harkens back to the tales his grandmother Olive Hamilton Steinbeck told him. She swore she had not only seen the Dark Watchers but also claimed to have traded them fruits, flowers, and walnuts. Benjamin Brode, a masterful painter inspired by both early California impressionism and contemporary landscape artists, decided to pack up his old VW van and head up to Big Sur see if he could capture some of the Dark Watchers’ mystery on canvas. In this book he paints a series of 26 oils lovingly reproduced in this elegantly designed volume by Caroline Paine, Brode’s daughter. This is the first book from Steinbeck Press, an innovative writers’ cooperative publishing house. Organized into three sections–a history and description, the search, and an epilogue–the book takes the reader through Brode’s perambulating search for the elusive beings of the Sur. The tableaus Brode discovers in this isolated and pristine wilderness are like a time traveler’s glimpse into the past–had the journey been undertaken hundreds of years ago the views would remain the same. Each painting contains the spark of the spirit of the Sur and its transitory coastal sunlight that alternates the hues of the forest and the fog, creating textures upon textures, draping the wilderness in mystery, and mitigating color into darkness. Of special note is the painting Near Partington Cove. A lone windblown cypress clings to a cliff facing the sea, its tangled roots, disappearing into shadow, in a statement of persistence. Another is the painting labeled 4:30 AM at the Hermitage–this is quintessential Big Sur as many of us know it: stark, moonlit, and still. Solitary trees stand stubbornly in silhouette above the endless dark ocean that reflects the moon like a black mirror. The paintings themselves are stirring, but this book is also a deeply illuminating examination of the process of making and viewing art as well as an insight into landscape painting’s origins. In the widest sense that is what this book is about. The Romans coined the original term and in ancient times this spirit was envisaged as an actual creature, a guardian animal or supernatural being such as an elf, a fairy, or ghost. How far away from this original idea of Genius loci are the Dark Watchers? Over time, beliefs of literal spirits were discarded and less supernatural concepts have prevailed. But this concept has imbued landscape painting with its purpose and meaning. Guo Xi (c. 1020 – c. 1090), one of the most famous artists of the Northern Song dynasty in China, wrote that the task of the landscape painter is to learn “how to pluck a scene from beyond misty reaches.” To do this the painter must find the essence of the scene rather than its outward trappings. After all there is a difference between painting a landscape and rendering a map. The paintings in this collection seem to be in touch with the real thing–the original spirit. They’re unadorned, unpretentious vibrancy speaks of an original edenic attachment to the land. There doesn’t seem to be an intermediary between the artist and the landscape, unless it’s the enabling influence of the Dark Watchers themselves. With the smile of a Cheshire cat, Brode admits that he first encountered wee folk in a pepper tree by his home. “I found myself more influenced by the natural world than the human world,” he adds with a leprechaun’s twinkle in his eyes. And as far as the Dark Watchers are concerned he confesses that to his surprise, they were everywhere. So many would show up in the shadows as he was painting that he was practically stumbling over them. If you have a love of Big Sur, a good story and great painting then this book may be exactly what you’re looking for. The authors will sign books Saturday, November 15, 3 p.m., at Tecolote Books (1470 E. Valley Rd.) and Sunday, November 16, 2 p.m., at Chaucer’s Books (3321 State St.). See darkwatchersbook.com.